American Prehistory has students study the evidence of 8000 years of Native American prehistoric land use practices. By analyzing images of Native American material culture, students will understand how artifacts and architecture reveal environmental attitudes of the culture. Students also will learn about the difficulties historians and other scholars face when attempting to study people who had no written language. 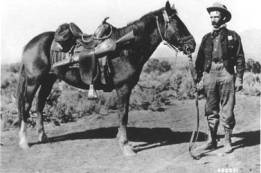 Image Caption: Typical early-day Forest Ranger in the southwest, Jim H. Sizer (shown here in 1910), who served as Ranger and Assistant Supervisor from 1909 to 1943 on the Apache and Tonto national forests. The student will understand how the Progressive Movement addressed the impact of industrial capitalism on trees and forests. Describe the role of institutions in furthering both continuity and change. The student will analyze and explain ideas and governmental mechanisms to meet needs and wants of citizens, regulate territory, manage conflict, and establish order and security. Download and print Module 5 Teacher & Student PDFs using Adobe Acrobat and make copies of the student pages, one per student. Set the stage for this activity by writing the following quote on an overhead sheet or blackboard. Do not include the author of the statement or date. When do you think this statement was written? Why? What is the problem the author refers to and who does he believe can solve the dilemma? What solution(s) do you think the government devised to solve the problem? What solutions do you think private citizens devised? Distribute the Essay, Worksheet 1, and Worksheet 2. Have students read the essay in order to complete the two worksheets and obtain background on the important topics and concepts for the lesson. Students will read oral history excerpts to gain an “insider's” perspective on the education of early foresters and their subsequent employment opportunities. Distribute the 3 Oral histories (Henry E. Clepper, Inman F. Eldredge, and Rudolph L. Fromme) and Worksheet 3. Students should complete the worksheet based on the essay, the oral histories, and class discussion. Show students several samples of “Help Wanted” advertisements from any newspaper and discuss the purpose of this type of announcement. Distribute Early Forestry Clues, Modern Forestry Clues, and Worksheet 4 and provide class time for students to work in pairs to compose their own “Help Wanted” ads. Ask students to brainstorm about the meaning of the word profession. As a class, compose a list of professions and then create another list that includes characteristics common among most of the professions. Distribute Forestry Follows the Professional Path and Worksheet 5. After students complete Worksheet 5 write the following passage on an overhead sheet or the blackboard. How did President Roosevelt regard the new profession of forestry? Based on what you now know about the development of forestry during the 20th century do you believe the profession succeeded in the mission described by Roosevelt? Why or why not? Using the information below as a guide, invite a forester to the class for a visit. Ask students to generate questions for the visitor so as to learn more about the profession of forestry. Use the categories listed below to identify a forester near you. Use the following web pages to locate a forester. During the course of the week students will be reading excerpts from the oral histories of 3 pioneers in the field of forestry. Using a book such as Oral History: A Guide for Teachers (and others) [Sitton, Thad, George L. Mehaffy, and O.L. Davis, Jr., Austin: University of Texas Press, 1983] as a starting point, have students conduct an oral history project of their own. Possibilities could include interviewing a retired forester or someone currently working in the field. Technology: Instead of having students complete Worksheet 5 on the sheet provided, have them create and complete their own timeline that outlines the events involved in the evolution of the forestry profession. English: One of the extension suggestions for this activity asks students to conduct their own oral histories of a local forester. In addition to asking students to read aloud to the class excerpts of their interviews, have students locate and read a transcribed oral history of a forester or person employed in an environmental profession. Math: Have students examine how math is used in the modern profession of forestry. Ask students to present their findings to the class. Science: Ask students to research the scientific and technological advancements made during the Progressive Era. Have students include a section on the changes in forest science during the period. Argow, Keith A. “Professionalism and Ethics, A History Within SAF.” Forest History (August 1975): 460-463. Block, Nadine E. “Credentialing and Accreditation Programs.” Journal of Forestry (April 2000): 18-22. Clepper, Henry. Professional Forestry in the United States. Baltimore, Md. : Johns Hopkins University Press, for Resources for the Future, 1971. Hays, Samuel P. Conservation and the Gospel of Efficiency. Pittsburgh: University of Pittsburgh, 1999. Reprint of 1959 original. Jolley, Harley E. “The Cradle of Forestry.” Forest History (1998): 18-20. Pinchot, Gifford. Breaking New Ground. Washington, D.C.: Island Press, 1947. Reprinted in 1972, 1987, and 1998. Pinkett, Harold T., “Consulting Forestry.” In Encyclopedia of American Forest and Conservation History, edited by Richard C. Davis. New York: Macmillan Publishing, 1983. West, Terry L. Centennial Mini-Histories of the Forest Service. Washington, D.C., United States Department of Agriculture, 1992. Williams, Gerald W. The USDA Forest Service – The First Century. Washington, D.C.:USDA Forest Service, 2005. Forest History Society Bibliographic resources on forestry, conservation and environmental history. The Greatest Good Film. Society of American Foresters Helpful information about the profession of forestry, including career advice and links to resources in the field. USDA Forest Service Official website of the Forest Service that includes photos, employment information, and current information regarding the activities of this government agency.